I`ve just got back from a week at Methodist Conference and then two weeks on holiday to glorious (wet and windy) Wales. It has been a special three weeks for a variety of reasons, some of which I hope will emerge in later blogs. 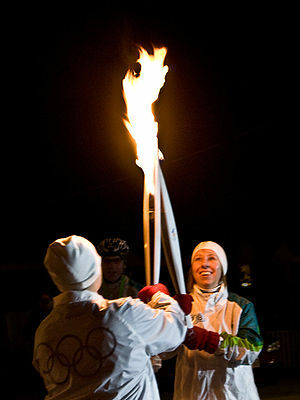 However when I got home yesterday it was to find out that I can now announce that I have been nominated to carry the Olympic torch for the London games in 2012 ! www.lloydstsblondon2012.co.uk is the website on which my entry stands. A good friend has graciously nominated me for this honour and whilst I may not be the one who gets to carry the actual torch, even being nominated is an honour in itself. You can understand my excitement. In 2002 I was privileged to carry the torch for the commonwealth games in Manchester and I still have my running gear for that event (still fits, just !!). How do we hold these honours in our hearts ? I think that every one of us needs to know how valuable and dear we are to other people: we have a need to be important in the eyes of someone else. I think that when we are honoured in some way it means a tremendous amount in terms of encouragement, in self-esteem and in our own sense of worth. The trouble is that we expect honours to take the shape of events such as the olympic torch or MBE`s & knighthoods and we miss (or take for granted) the day-to-day honours that come the way of most of us. I believe that those honours come through the encouraging words of a friend, through time spent with a friend, through a small child telling Mum or Dad “I love you”, or a neighbour checking up on another neighbour for no reason other than concern. These and so many more are honours in themselves for surely the true meaning of giving an honour is to say that the receiving person is `of worth`. If we take that meaning correctly then surely the honour that we all look for is the honour that comes with friendship, the friendship of husband and wife, of brother and sister, of tried and trusted friends. I receive the honour of the olympic torch nomination within the generosity it was made, I receive it with pride and whether or not I ever get to lay my hands on the real torch is not the issue for I will always know that someone thought that I was `of worth` to them and others. Having said that I hope I get selected !!!!!! !